As the Director of Travel for the prestigious Hamburg-based firm Vladi Private Islands, Olaf Lock and his specialist team had been responsible for renting some of the world’s most expensive private islands to international famous clients. Incredible destinations include places like Tagomago Island in Spain, which rents for between €100,000 and €250,000 per week, and David Copperfield’s Bahamian island of Musha Cay, the use of which starts at US $37,500 per day. When it comes to private islands, however, not all of Vladi Private Island’s holiday rentals require a five, or even six-figure budget – in fact, there are amazing opportunities at prices comparable to a nice mainland hotel. 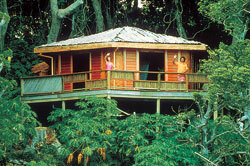 “All holidays on private islands are inherently special,” said Mr. Lock, “and they can be made to suit many different budgets.” Here, Private Island News explores a handful of the more affordable range of these island paradises. The rolling green hills and wooden lodge on this epic isle suggest a bucolic, relaxing holiday to come – and there’s certainly no stress about the price. Tasty fresh produce from the island’s own farm and lots of seafood from the surrounding waters makes it easy to detox from urban living, and vast sea and island views will soothe the soul. Scattered with interesting Maori archeological sites and just 170 km from Auckland, Slipper Island is also a great place to explore more of New Zealand’s culture and history. 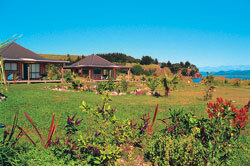 Pleasant at any time of year, New Zealand is at its peak warmth from November to April. 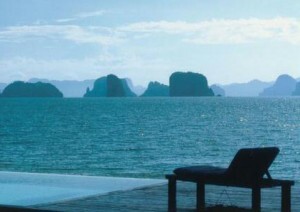 On this lush semi-private isle in the impossible gorgeous Bay of Phuket, each bungalow is wrapped in its own garden and faces onto a sandy white beach – and across the water, otherworldly limestone mountains rise out of the seas, creating a dream-like atmosphere found in few other places on earth. Koyao Island Resort may sound extravagant, but at the cost of a mid-range hotel, it’s a great value holiday sure to provide unforgettable memories. Friendly Thai hospitality, a wide range of activities, and delicious local cuisine all make this island a rejuvenating getaway. The best season to visit syncs perfectly with the Northern Hemisphere winter: November to February. Bringing to mind a picturesque, windswept portrait of a bygone era, it’s no surprise that people are eager to spend the night in an authentic Victorian island lighthouse. Found just an hour’s drive from San Francisco, East Brother Island is a history-rich place with plenty of stories to tell about California’s rugged, pioneering past. This intimate inn is known for its hospitality, greeting guests with champagne and hors d’oeuvres, and has just a handful of bedrooms – and for the daring, a small room in the separate fog signal building. Epic views from the island include the coastline of Marin County, the craggy peaks of Mount Tamalpais, and as a little reminder that modern civilization still exists, an amazing vista of the San Francisco skyline. Proceeds go to support a great cause, the continuing preservation of the lighthouse. 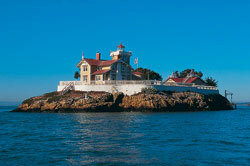 The coastal weather is most temperate from April to November, but the lighthouse is open all year. A true paradise in the heart of Fiji, this unique dragon-shaped island is home to a resort offering a fantastic value. In a region where many private island resorts can top $2000 a day, Namenalala gives an authentic Fijian experience at a fraction of the cost. Enjoy a delicious roasted palm heart and a platter of fruit grown in the island’s orchard while gazing out at the blue South Pacific Sea – and perhaps after lunch, a snorkelling trip in the pristine Namena Barrier Reef or a lazy nap in your bamboo “bure”? With Fiji’s pleasant climate, the island offers a tropical escape at any time of year. The price tag for a night at Dark Island’s Singer Castle may be the highest on this list, but the experience is an excellent value for the money: a romantic night as the ruler of your own island kingdom! Everyone carries within them the fantasy of living as royalty in a beautiful palace, and this replica Scottish castle on the picturesque St. Lawrence River offers a truly incomparable night or weekend away from the cares of the modern world. The well-appointed Royal Suite, where picture windows display views of both the lovely sunrise and sunset, is the only room for rent in the castle, making it ideal for special romantic occasions like honeymoons and anniversaries. 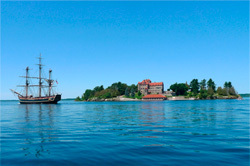 Nearby attractions like the charming boating town of Alexandria Bay and fairy tale Boldt Castle only add to the fun. This seasonal destination opens this year on May 19th, 2012.